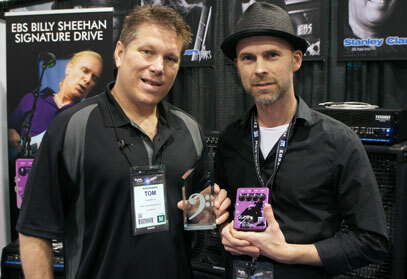 Home / NEWS / ARTIST NEWS / EBS @ NAMM Show ’13: Day 4 – EBS “Best In Show”! 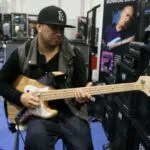 EBS @ NAMM Show ’13: Day 4 – EBS “Best In Show”! EBS was honored with a “Best In Show” award from Bass Gear Magazine, here presented to Ralf by editor Tom Bowlus. Sunday had a few surprises left of goodies for sure! 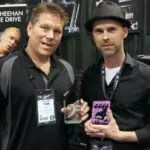 EBS landed a “Best In Show” award for EBS Billy Sheehan Signature Drive from Bass Gear Magazine, and a lot of our friends came by that hadn’t had the chance to stop by earlier or returning to say goodbye. We would like to thank everyone coming out to see us, check out the gear and watching our amazing artists perform for a great show and we will definitely be back next year! 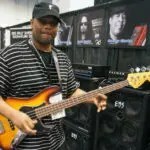 Enjoy the Sunday pics and come back soon for more, including videos from NAMM! 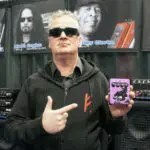 At the end of this post, you’ll find a video feature with Billy Sheehan on the new pedal that MusicRadar.com put out from the show! See ya soon! 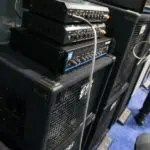 Jennfer Lopez bass player and Musical Director Bryant Siono checking out some EBS amps. Ralf with one of the basses from Sandberg that we got to use for the show. Thank U! 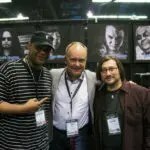 Lot’s of bass wisdom in this picture! 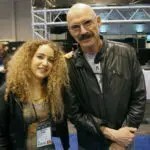 EBS Artist Tal Wilkenfeld and EBS Pedal Artist Tony Levin! Ralf with Tal and Tony. 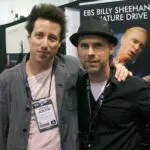 French EBS Artist Fred Schneider with the EBS Billy Sheehan Drive! 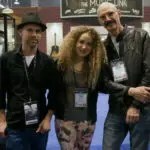 Bo with EBS Artists Jackie Clark and Eddy Khaimovich. EBS Artist Jackie Clark, ladies and gentlemen! 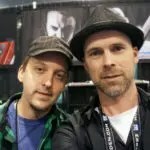 EBS Pedal Artist, bass player and producer Justin Meldal-Johnsen. With two Reidmars you can drive two 4 ohm cabinets, using the preamp on one of the amps, with separate volume controls for each cabinet. 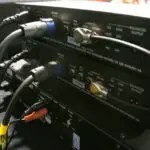 Connect one speaker to each cabinet, then connect Effects Send from the amp you intend to use the preamp from, to Effect Return of the next one. 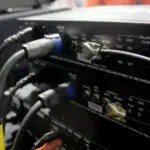 Voila, you just got a rig for any big sized gig! 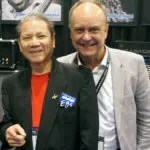 Legendary bassist and EBS pedal artist Phil Chen with Bo. Ps. Apparently, one of the links to the blog from www.ebssweden.com does not work properly. If anyone hear about someone having trouble to visit the blog, they should use www.ebssweden.com/ebsblog and they will come through. 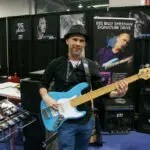 EXTRA FEATURE OF THE DAY: BILLY SHEEHAN PLAYS AND TALKS ABOUT THE EBS BILLY SHEEHAN SIGNATURE DRIVE! EBS @ NAMM Show ’13: Special feature.